REST API to send and receive SMS, Viber and WhatsApp messages. Messaging API helps you add different messaging capabilities to your applications. Using our REST API, you can send and receive SMS, Viber and WhatsApp messages. * Receiving messages feature is currently in development. Write us to get early access. We'll add new channels on a request basis. Contact us to request features that we don't support yet. You can also send a single message to multiple channels by setting a fallback priority in the outgoing request. If the message recipient has not signed up or is not available on one of the channels, then Messente picks the next channel from the priority list. For example you can send message to Viber first and if the user is not registered to Viber, then WhatsApp is tried. 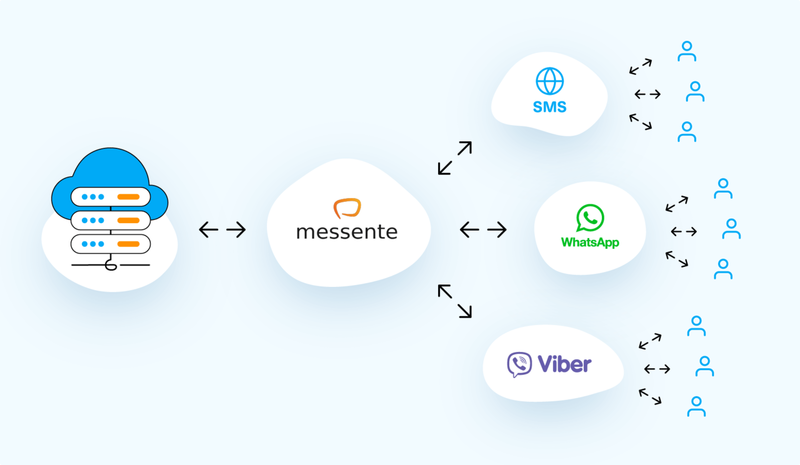 If the user is not available on Whatsapp either, then Messente tries SMS. To start sending Viber and WhatsApp messages please contact our support team.